October 2013: The issue of London’s electricity infrastructure is being raised in several quarters now, most recently by the Mayor in a letter to Secretary of State for Energy , Ed Davey, and through the Mayor’s High Level Electricity Working Group. More recently the GLA London Infrastructure Group has looked at future constraints on London’s electricity network, which has led to the recent commissioning of a piece of research work looking at barriers to connection to the electricity distribution network in the capital. September 2013: The Mayor’s concerns over “uncertainties of our energy supply and growing chances of supply disruption in the coming years” have been highlighted in correspondence between Boris Johnson and Ed Davey, the Secretary of State for Energy and Climate Change, Ed Davey, released this week. The Mayor calls for major changes to the regulatory control framework rules for distribution network operators (DNOs). As these are predominantly monopoly businesses, the operating framework is set by energy regulator Ofgem. DNOs are the companies operating the local electricity grid (as opposed to the higher voltage ‘national transmission grid’) and in London the majority of the distribution network is managed by UK Power Networks and parts of west London by Scottish & Southern Energy. The Mayor letter calls for a “urgent review of the currently regulatory regime to ensure that DNOs are able to invest in energy infrastructure and install capacity ahead of need”. The Mayor’s correspondence with Ed Davey is set out in Appendix 6a of the following GLA document. The Mayor has established a ‘High Level Electricity Working Group’ to look at many of the issues raised above and minutes and papers from the three meetings that have taken place to date of this group can be found here. A further recent paper looking at London’s electricity infrastructure by the London Infrastructure Group can be viewed here. Bringing DSR and Planning Together? GLA “officers are currently in the process of setting up a mechanism to provide UKPN regularly with up to date data from the GLA’s London Development Database in particular about planning permission.” Provision of this data will allow UKPN a better understanding of where future developments are likely to come forward, and foresight on where future energy demand – and potential future new decentralised energy generation capacity connected to the distribution network – is likely to be introduced. The minutes also capture the following interesting point: “It was also mentioned that demand side response measures work best in new developments. GLA officers confirmed that development could be encouraged to be ‘demand-side-response ready’ through the London Plan. This will be considered as part of the Further Alterations to the London Plan.” The discussions do not go on to explain how this could be done, but energy management systems on site could potentially reduce the load of a building during times of peak grid system demand (ie reduce lighting or electrical heating/cooling uses, restrict lift use) or potentially looking to onsite decentralised energy systems exporting more of their output (or conversely when there is a lot of wind or perhaps PV output on the grid, onsite DE systems such as CHP could switch off). UK Power Networks (UKPN) – under their Low Carbon London Programme – are already undertaking trials of such demand response activities – see the following press release. 18 June 2013: In November of last year the Mayor held an Electricity Summit at City Hall where a High Level Electricity Working Group was formed to “discuss the energy systems needed by London over the coming decades and the mechanisms by which the challenges can be met”. A background paper Delivering an Accessible and Competitive Electricity Network for London was presented as well as a presentation setting out the remit of the Working Group. The papers from the first two High Level Group Meetings have now become available and can be downloaded here (15 January) and here (28 March). The third of the Working Group meetings took place today: Sir Edward Lister is standing down from chairing, and the Mayor’s Environment and Political Advisor Matthew Pencharz will attend the Group meetings from today and chair from henceforth. See here for the Mayor’s response on how renewable generators issues will be represented on the Group. Smart metering (SM) – monitoring residential and commercial electricity use and trialling variable tariff pricing to shift consumption behaviour. Small-scale embedded generation (SSEG) – quantify generation output, understand demand and manage techniques for accommodating these connections. Electric vehicles (EV) – understand and influence EV charging patterns and manage the impact on the electricity network. Distributed energy (DE)/Distributed generation (DG) – active network monitoring (ANM) – quantify generation output, understand how to facilitate and manage DG and how active control can be used by DNOs. Demand response (DR) – understand the potential to postpone/defer electricity network reinforcement during peak demand. Further information on Low Carbon London here. Appendix A of the report provides some further information. The consultation runs from 8 Nov 2012 to 20 Dec 2012. Further information on decentralised energy opportunities are set out in Camden’s Heat Map (scroll to the bottom of page). 23 March 2012: This report, commissioned by London First in conjunction with the City of London and City Property Association looks at the “long-standing concerns from developers about the challenge of securing a reliable and timely connection to the electricity network for new projects, particularly in the City and the West End where there is often little spare capacity.” Further detail here; report downloadable here. 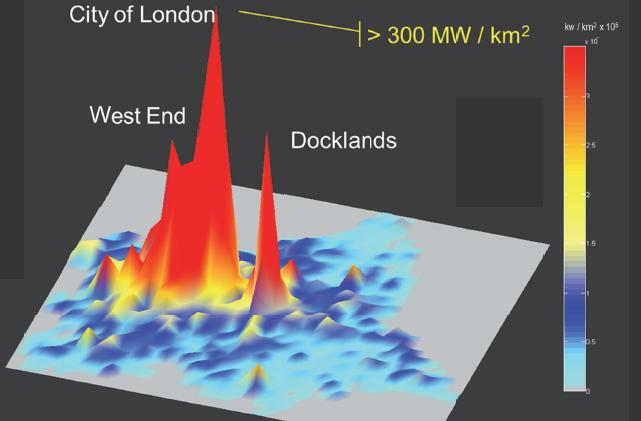 Measure of the density of central London’s electricity demand. General communication and performance by the Distribution Network Operator (DNO) in dealing with developers could be improved. We recognise that in confidential interviews of this type there is a danger of focussing on the negatives, but found the level of dissatisfaction notable. There is a sense that developers cannot get the level of service they want,or indeed feel is necessary from the DNO. It is notable that developers stated that they would in general be willing to pay more for such a service,but this was not on offer from the DNO. In practical terms, developers expressed a preference for a quick guaranteed connection and suggested that a greater degree of anticipatory investment by the DNO would help to facilitate this. In relation to the third point, above, there is a lack of understanding as to why the DNO has not invested to a greater extent in London’s Central Business District (CBD) in light of the view that there will be a significant localized increase in electricity demand over the next ten years. Mayorwatch has posted a news story which includes a comment from London’s DNO- UK Power Networks– in response to the study. March 2012: Recent news release from the Low Carbon London project stating that: “The first 500 smart meters have been installed by EDF Energy in homes across London as part of a pioneering pilot to cut carbon across the capital. …EDF Energy, as a member of the Low Carbon London programme, plans to fit 5,000 smart meters across London and in the Mayor’s low carbon zones, Green Enterprise District and RE:NEW areas by the end of August.” The full news release can be read here. Further information on smart metering initiatives in London can be read here. The trials are taking place in a number of areas around London including Lewisham, Archway, Canning Town, Barking and Peckham. A comprehensive campaign to identify 500 trial smart meter customers in London Low Carbon Zones has been undertaken and 263 meters have been so far installed (more of which here). Partner organisation Imperial College has opened the ‘Low Carbon London Learning Lab’ (more of which here and here). A series of ‘innovative DNO-level Demand Response Contracts have been signed’ – see earlier post for details on this. 18 November 2011: As part of the ‘Low Carbon London’ project, 5,000 smart meters are to be installed in homes and businesses across London. EDF Energy customers in the pilot zones, Lewisham, Perry Vale, Canning Town, Archway, Barking, Muswell Hill and Peckham, are being offered the first 500 smart meters, extending to EDF Energy customers in the ten low carbon zones and the Green Enterprise District later next year. Read full details on the following press release from London’s electricity distribution network operator, UK Power Networks. Further information on the ‘Low Carbon London’ project – which is funded through Ofgem’s Low Carbon Network Fund – can be seen here and here. The increased use of decentralised energy is a key element of London’s energy strategy, and the Mayor has established a target for 25% of London’s heat and power to be sourced by localised DE schemes by 2025. Prohibitively complex grid code requirements placed on these smaller distributed generation systems. No regional aspects are highlighted in the findings – that is – is it any harder/easier to connect DE to London’s electricity distribution system (operated by UK Power Networks in the main and also SSE in SW London) than anywhere else, however, if London is to significantly increase its use of DE, the numerous barriers identified by smaller generators that currently exist need to be removed.